The Dark Tower Goes Darker Still. 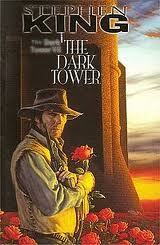 It's not a great day for Stephen King fans looking forward to the screen adaptation of The Dark Tower. The option was passed on by Universal and now Warner Brothers has passed on the project too. Warner Brothers had been the projects best hope with a script from Akiva Goldsman prompting some interest from Russell Crowe to play the lead. Director/producer Ron Howard still has a shot at getting the project made because now Imagine Entertainment, Howard's company, is finally free to shop the project around. According to Variety, the ambitious project ' - based on a 9volume series - would have encompassed three films and two TV series, the latter most likely being handled by HBO. It seems clear that Warner Brothers just wasn't comfortable making such a gargantuam financial commitment that the array of films and television shows would require. I haven't read the books. What about you? Are you disappointed that you wont get to see Russell Crowe as Roland Deschain? Just read that MRC, the same company that helped Seth McFarlane get TED financed are really, really interested in getting The Dark Tower onscreen. So Dark Tower is looking a little bit lighter now!